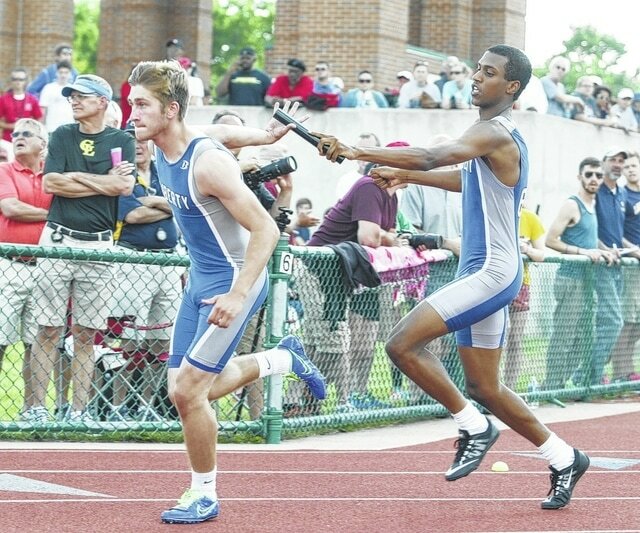 Liberty’s Trevor Collins, right, hands the baton to Josh Pickens during the finals of the 4×200 relay Saturday at Jesse Owens Memorial Stadium. The team finished third in the event. It was a parade to the podium for local athletes as 10 standouts in a combined seven events were honored for finishing in the top eight during Saturday’s Division I Track and Field State Championships at Jesse Owens Memorial Stadium. One of the youngest ended up highest when the medals were handed out as Liberty freshman Emma Bower finished as state runner-up in the girls 3,200. Bower crossed the finish line in 10:56.02, 18 seconds behind Cincinnati St. Ursula Academy senior and state champ Annie Heffernan and a fraction of a second ahead of teammate and third-place finisher Claire Wiles. Wiles, a senior, nabbed the third-place finish after closing fifth in the finals of the 1,600 (5:00.02). Even after running the better part of three miles, one of Wiles’ best trips came in the final lap of the 3,200, when she circled the track in 1:14.904. The other top-three finish belonged to Liberty’s boys 4×200 relay team (Michael Tweddle, Trevor Collins, Josh Pickens and Jacob Merrels), which finished third in the state thanks to a mark of 1:27.74. Liberty coach Ryan Snivley said the top-three showing, easily the best in school history in the event, didn’t surprise him, but did exceed his expectations. Tweddle, who ran the first leg, said the late-season push stemmed from district disappointment as the team saw a shot at advancing in another event, the 4×100, slip away. Pickens, who ran the third leg, said the third-place finish was gratifying to say the least. Hayes junior Ethan Tucky also sprinted his way onto the podium, finishing sixth in the finals of the boys 200-meter dash. Tucky finished in 21.91 — a mark less than three tenths of a second behind Nordonia senior and state champ Danzel Ward. Olentangy senior Brandon Bice, Orange sophomore Hunter Moore and Big Walnut freshman Abe Myers also earned spots on the podium. Bice finished sixth in the boys pole vault (14-06), Moore finished seventh in the boys 3,200 (9:20.75) and Myers closed eight in the boys discus (159-0). Liberty’s Sam Silber, Mitchell Towne and Ryan Jones competed during Saturday’ second day as well. Silber finished 15th in the girls pole vault by clearing 10-06, Towne closed 13th in the boys 800 in 1:58.43 and Jones finished 11th in the boys pole vault with a mark of 13-0.